FortiSwitch Rugged switches deliver all of the performance and security of the trusted FortiSwitch line, but with added reinforcement that makes them ideal for deployments in harsh outdoor environments. Resilient, sturdy and capable of withstanding intense temperature fluctuations, FortiSwitch Rugged ensures the integrity and performance of mission-critical networks in even the most challenging of deployments. Engineered to survive in hostile environments with an extreme temperature range, the combination of FortiGate Rugged network security appliances with the FortiSwitch Rugged provides a connected network security solution. The Power over Ethernet (PoE) capability enables simple installation of cameras, sensors and wireless access points in the network, with power and data delivered over the same network cable. There is no need to contract electricians to install power for your PoE devices, reducing your overall network TCO. Sturdy IP30 construction Built to ingress protection 30 standards, the construction of the FSR-112D-POE is designed to perform while enduring hostile conditions. Passive cooling With no fan and no moving parts, the mean time between failure for the FSR-112D-POE is greater than 25 years. Redundant power inputs Maximizes network availability by eliminating the downtime associated with failure of a power input. Power over Ethernet capability Seamless integration of peripheral devices such as cameras, sensors and wireless access points into the network. * For -D- models there is a dependency on the software version running on the FortiSwitch and on the FortiGate in order to use FortiLink mode. FortiLink is only enabled on certain ports on FortiGate and FortiSwitch. Refer to FortiLink documentation. Note: Please refer to FortiSwitch Admin Guide for details re: port connections supported for FortiLink functionality. * Note: Check release notes for software feature availability. ** MIBs have been tested with Solarwinds NPM tool. 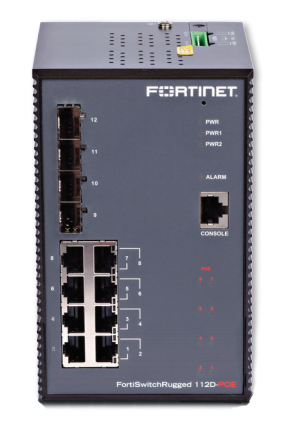 Download the Fortinet FortiSwitchRugged Series Datasheet (PDF).